This article shows how to add a JavaFX scene graph to a Standard Widget Toolkit (SWT) application, and how to make SWT and JavaFX controls interoperate. "Adding JavaFX Content to an SWT Component"
"Creating SWT-JavaFX Applications in an IDE"
If you develop SWT applications, you know that SWT uses the native operating system controls and cannot easily be configured to use advanced GUI features, such as animation. You can quickly add sparkle to an SWT application by integrating JavaFX with SWT. All you need is the FXCanvas class from the javafx.embed.swt package. The javafx.embed.swt package can be found in jfxswt.jar, which is located in the JDK_Home/jre/lib/ directory. FXCanvas is a regular SWT canvas that can be used anywhere that an SWT canvas can appear. It's that simple. In this article, you will see how to create an interactive SWT button and JavaFX button, shown in Figure 8-1. When the user clicks either button, the text is changed in the other button, as shown in Figure 8-2 and Figure 8-3. This example shows how the SWT code and JavaFX code can interoperate. Description of "Figure 8-2 Clicking the SWT Button Changes the JavaFX Button Label"
Description of "Figure 8-3 Clicking the JavaFX Button Changes the SWT Button Label"
In JavaFX, the Java code that creates and manipulates JavaFX classes runs in the JavaFX User thread. In SWT, code that creates and manipulates SWT widgets runs in the event loop thread. When JavaFX is embedded in SWT, these two threads are the same. This means that there are no restrictions when calling methods defined in one toolkit from the other. Example 8-1 shows the code to create the SWT button and JavaFX button shown in Figure 8-1. As shown in the code, you set JavaFX content into an FXCanvas with the setScene() method in the FXCanvas class. To force SWT to lay out the canvas based on the new JavaFX content, resize the JavaFX content first. To do this, get the JavaFX Window that contains the JavaFX content and call sizeToScene(). When JavaFX is embedded in SWT, a new preferred size is set for FXCanvas, enabling SWT to resize the embedded JFX content in the same manner as other SWT controls. JavaFX constructs content in terms of a hierarchical scene graph, placed inside a scene. 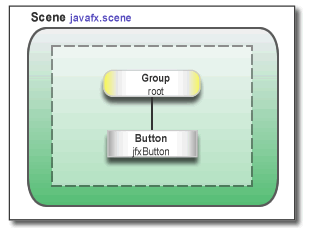 The code in Example 8-1 places the JavaFX button into a scene with the scene graph shown in Figure 8-4 and described in comments in the code example. Description of "Figure 8-4 JavaFX Scene Graph in SWT Application"
Ensure that all JAR files are either 32 bit or 64 bit, as required for your environment. How you package your SWT-JavaFX application depends on whether JavaFX is bundled with the JDK (7u6 and later) or installed in a different location (for releases prior to JDK 7u6). If you use NetBeans IDE 7.2 or later, no special handling is required to package your application, provided you have added the libraries as described in Creating SWT-JavaFX Applications in an IDE. You can simply do a Clean and Build, which produces a double-clickable JAR file in the /dist directory of the project. When an SWT-JavaFX application is built, the JAR file must be packaged as a JavaFX application so the application on startup will look for the standalone JavaFX Runtime on the user's system. The SWT library (swt.jar) must be included as a resource (32-bit or 64-bit to match the target system).